Customize your new mobile business cards, brochures, flyers, proposals, presentations, email autoresponder templates and more found in our Mobile Marketing Community members downloads. Follow our video tutorials to easily add your brand and look like an instant pro! All files are available in editable layered files to make changes easy. Take our 3-day Mobile Sales Mastermind and get access to over 40 hours of step-by-step sales training courses, cold calling scripts, mobile marketing campaign workshops and more. Learn the secrets to selling mobile marketing take your short-cut to becoming a mobile sales expert, overnight! Use our proven blueprint and mobile lead tools to find the millions of businesses in desperate need of your mobile marketing services. Build a list of prospects or target your current clients with mobile up-sells. Use our unbranded mobile demo site MobiDemo.net as a walk-in portfolio. 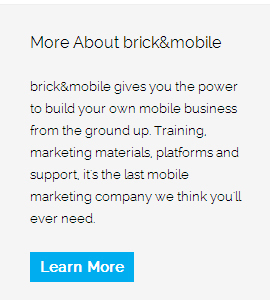 Use our Mobile CMS to build UNLIMITED demo sites for your clients and prospects. Watch our step-by-step training videos and use our done-for-you mobile website templates to clone sites guaranteed to work on ALL smartphones. Since all mobile websites are unbranded, we simply run the technology invisibly in the background. 5 Easy Steps to Selling, Profiting and Scaling Your Mobile Business! If you follow these 5 steps you can be the proud owner of your own mobile marketing business. Our pay-as-you-grow solutions make it easy to start small and grow BIG. What you charge your clients is up to you! For unlimited scalability, our White Label Mobile CMS packages include a 100% custom branded interface and bulk pricing.